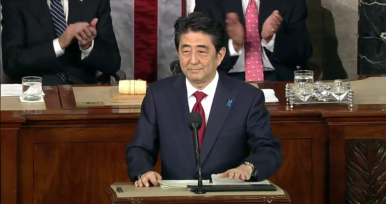 The content of Abe’s statement will depend on what sort of audience he has in mind. The reason why Abe’s upcoming 70th anniversary statement is attracting so much scrutiny today is because of the mixed message that he and his government have been sending. On the one hand, Abe has repeatedly said he would “inherit” the Murayama Statement “in its entirety.” But on the other hand, he has stated on several occasions that he believes he does not necessarily have to repeat the Murayama statement verbatim, even questioning the meaning of issuing a new statement if it is just a mere repetition of the Murayama Statement. To some (particularly in South Korea and China), this suggests a strong probability that Abe may depart from the Murayama Statement and will not use the word such as “aggression” and “remorse”—both of which they consider critical—in his upcoming statement. What can we expect to hear from Abe in his 70th anniversary statement? It may depend on the primary audience he has in mind when writing the statement. If his statement is targeted toward an Asian audience—victims of Japan’s pre-war and World War II aggression—Abe will largely follow the Murayama Statement. If his primary audience is the Japanese public, however, his statement may focus more on the future. In that case, although Abe would certainly “inherit” the sentiment of the government’s “remorse” for Japan’s role as an aggressor in World War II, his statement may speak more to Japan’s postwar recovery and his vision for the future of Japan. Abe, as the prime minister, certainly is entitled to decide which of these approaches he wants to take in his statement. Regardless of his intention, however, he needs to be mindful that his statement will have a global audience. Yuki Tatsumi is Senior Associate of the East Asia Program at the Stimson Center in Washington, D.C.